This patch replaces the original WoW Druid Forms with more visually cohesive ones. This is not strictly a downport from later expansions, I've modified many of the models and textures. See info.txt included with each download. -02/19/2017--Changed sound that sometimes plays when morphing into Travel form. Added Legion Bear Forms with custom improvements to eyes (glowing for NE, higher resolution for both). Added Legion Cat Forms with custom model tweaks. Improved vertex weights on Legion Moonkin model so /dance emote no longer causes the upper-back to overlap itself. -11/12/2017--Added textures for regular Flight Form that match up better with Epic Flight Form. Added Optional patch for more racially tailored Stag Form and Tree of Life Form. Do you plan on working on the 2.4.3 version? I've tried it and get it to work for a small while then it starts to error and boot you from WoW every time you open it. you need wowme in order to load custom patches in tbc. I keep getting a Can't read memory error. It works for a bit then it just stops working all together and crashed when i try and load into WoW. Edit - Seems the problem starts when I die. It will run perfect with the new model and when I die and release to graveyard the game crashes i get the can't read memory error and I can't get it to work again for a few hours. That's a pretty mysterious sounding error, it sounds like anti-cheat behavior considering you can't get back on for a while after it happens. I do plan on testing this, but I'm waiting on getting an account with a high enough level druid to test with. EDIT: I got my hands on a druid on 2.4.3 and fixed the random crash error. Download link is updated. Personally I'm not a fan of the new Cat Form alternates so I wasn't planning on adding them; to me they go against my "Cohesive" goal. I think the only way I would add them would be if it was part of an overall "were"-druid pack (werebear, werecat, werestag, were-everything). 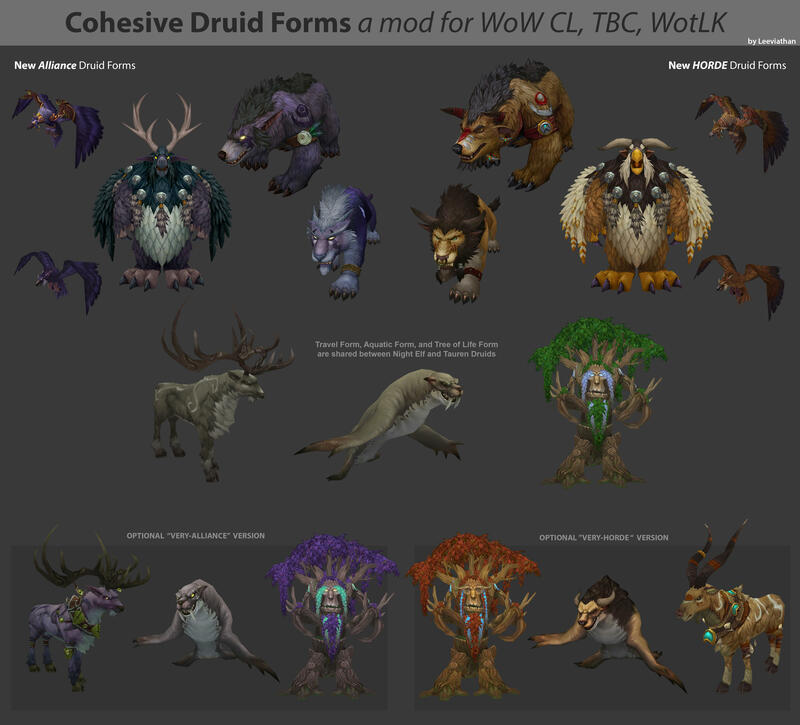 Right now the only thing left in my grand scheme is to somehow find a way to have Horde and Alliance Druids use different models/skins for their Travel Form/Aquatic Form (for which I'll have to create the unique Horde Aquatic Form in Blender). I doubt it's possible to do this by editing the client alone, so it's probably never going to happen unless I get some server support. Also I'd like to port the patch to every expansion, or at least to Cata. Glad to hear that you're bringing it to Cata. Whenever the other forms make it to legion alpha (i think cat form is there but I haven't seen any vids with bear form) will you be adding those? Surely, I am not the only one noticing this? This is on 1.12.1. The weapon appears when bear starts hitting in combat. Yes this is a bug/glitch found on 1.12 client. Its noted as far as i know but dont know when they gonna fix. I'm running 3.3.5a and am wondering if its possible to just use the stag forms for alliance and horde since I'm happy with the defaults in wotlk. Is this something that can be done? And if so could anyone provide instructions on how to do it? The bear showing weapon thing is something I only recently noticed. I'm investigating a possible fix now. I'm running 3.3.5a and am wondering if its possible to just use the stag forms for alliance and horde since I'm happy with the defaults in wotlk. I'm not planning on creating a stag-only WotLK patch, but it would be relatively easy to create using my patch as a base. I manage to put my hands in a beta legion client 20750 and i update to 21021, i can say that when i convert the druid models this isn't an issue anymore. I have told to Spik96 about it and to investigate his tools in deep. WoD models seemed to glitch but legion work, its really weird effect. Anyway Spik96 knows the issue i hope to find something helpfull. With Spik96's help I have solved my bear issue, I just need to repackage everything and upload it.